Welcome aboard! As the only Sea Scout Ship in the Heart of America Council, Ship 7007 has the resources and leadership to prepare our youth to make good ethical and moral choices over their lifetimes by instilling in them the values of the Scout Oath and Scout Law. Created for all youth age 14-20, the Sea Scout program brings excellence, discipline, and adventure without boundaries to the Kansas City area. The best part of Sea Scouts is cruising and mastering the skills you learn with your shipmates. On board a vessel you share hands-on experiences as helmsman and navigator, lookout and cook, sail handler and engineer. 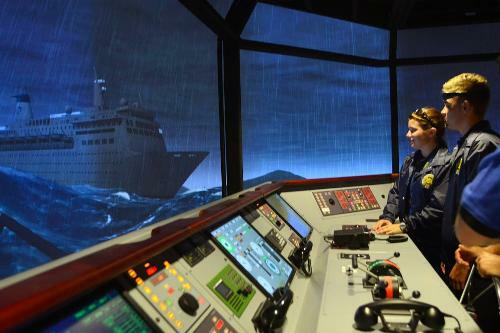 You and your shipmates will plan and conduct your annual cruise--summer camp underway. Imagine taking a powerboat down the Missouri and Mississippi rivers, taking a trip to go fishing on Lake Michigan, swimming in Hot Springs, diving and snorkeling, or anything else your ship wants to do! Sea Scouts are youth lead and adult mentored. You and your shipmates lead your Sea Scout program. Elected youth leaders plan and conduct the program and adult leaders guide and support your efforts as you learn important leadership and life skills. As you gain experience you will have the opportunity to contribute as a leader n your ship., Sea Scouts are recognized and rewarded for the things they learn and do. You can earn valuable certifications in SCUBA, boating safety, marksmanship, lifesaving, and CPR, as well as advance from Apprentice to Quartermaster. Each certification and level of advancement marks your growth as a sailor and a leader. Sea Scouts take service very seriously. Sea Scouts perform various kinds of serve from service to their ship to community service. River or beach cleanup efforts, food drives, youth programs, and so much more are just a part of how we work together to make our community better for everyone. Sea Scouts provide opportunities to share experiences with other young people who share your interests. As your ship participates in fun and exciting activities like sailing regattas, rowing races, and rendezvous, you will learn and grow with your shipmates. You will even have the opportunity to meet Sea Scouts from other parts of your community, the nation, and even the world!